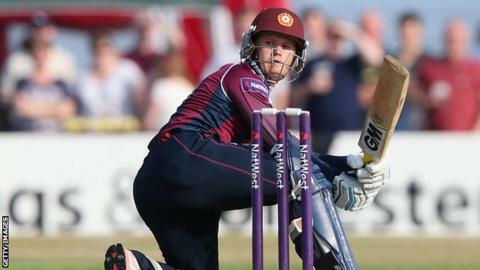 Northants batsmen Ben Duckett and Rob Keogh have signed new contracts to keep them at Wantage Road until the end of the 2017 season. England Under-19 international Duckett, now 20, and Keogh, 23, have scored a combined total of 1,335 Championship runs this season. Duckett has hit three centuries and averages 52.92, while Keogh has two. "We've seen them grow as young players and young men during their time here," said head coach David Ripley. The announcement of the deals came after it was confirmed all-rounder David Willey will join Yorkshire next season. Meanwhile, Ripley revealed the club are in talks with Pakistan all-rounder Shahid Afridi, who had a six-game stint at Wantage Road earlier this season, to rejoin them for T20 Blast finals day at Edgbaston on 29 August. "There's a possibility, but we haven't progressed that any further," he told BBC Radio Northampton. "We hadn't gone down that road until Graeme White got injured. "He's got another commitment that needs shuffling around; it's with him at the moment and we'll hopefully have good news on that shortly."